Celery contains certain toxins called psoralens with potentially carcinogenic effects and goitrogens with potentially anti-thyroid effects. Celery is also one of the vegetables highest in pesticide content, unless it is organically grown, and is vulnerable to a kind of mold called mycotoxins. There are, however, ways to grow, select, prepare and consume celery to minimize the associated health risks. Celery contains a kind of natural toxin called psoralens that can cause the skin to become more sensitive to the harmful effects of ultraviolet radiation, a condition known as phytophotodermatitis. As such, they are considered photocarcinogenic. According to David H. Watson in his book "Natural Toxicants in Food," cooking, and especially boiling, breaks down the psoralens in celery but does not destroy them completely. Effects of phytophotodermatitis include skin rashes and discolorations, blisters and sunburn. Also known as glucosinolates, goitrogens are a compound made of sugar and sulfur that can have a negative effect on the thyroid, namely inhibiting its iodine uptake. According to a report titled "The Nutritional Significance of Naturally Occurring Toxins in Plant Foodstuffs" cited in the FDA Poisonous Plants Database, goitrogens in vegetables like celery are estimated to account for 4 percent of goiter incidences, or swelling of the thyroid, in the world's human population. According to a report released in 2010 by the public health nonprofit group Environmental Working Group, inorganic celery is at the top of the "Dirty Dozen" list of fruits and vegetables containing the most pesticides, with 64 kinds of pesticide in each serving. Because celery has no protective skin to absorb harmful pesticides, consumers are more likely to ingest those pesticides when eating the vegetable. Chronic effects of residual pesticides in food on human health is still a subject of much study. Pesticides in food have been linked to certain immune dysfunctions and cancers. Additional evidence has linked food pesticides to neurological and developmental problems in children, including ADHD. Celery is high in nitrates, which, when exposed to certain micro-organisms contained in foods and in the gastrointestinal tract, can be reduced to potentially toxic nitrites. In large enough doses, nitrites can cause methemoglobinemia, or the loss of hemoglobin's oxygen-carrying ability, and even death. However, evidence has only linked high-nitrate vegetable sources to nitrite toxicity in infants. 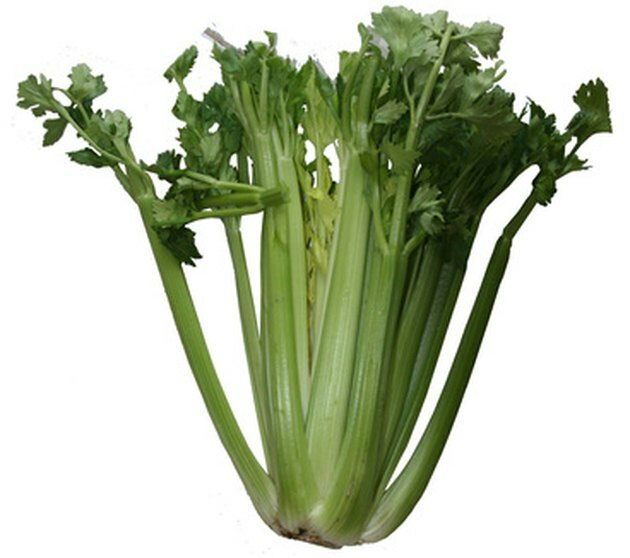 Celery is vulnerable to certain molds called mycotoxins, including aflatoxin or black mold. Aflatoxins are known carcinogens. Other potential health effects of mycotoxin consumption include abdominal pain, vomiting, edema, convulsions, liver damage, mental impairment and problems with digesting, absorbing and metabolizing food. The psoralens on celery originate from a brownish fungus known as pink rot. Only eat celery with no brown spots to avoid taking in psoralens. Avoid consuming the pesticides in inorganic celery by buying only organic celery or from a local grower you trust. Its lack of skin makes washing any pesticides off the celery nearly impossible. Even the celery found in the Environmental Working Group's study to contain so many pesticides was power-washed by the USDA before testing.